To get a better comparison with other users could you provide a bit more data. How old is your car? When did you buy it? How fast do you drive, how hard do you brake? How hot does your area get in summer? How often do you use the AC.? How cold does your area get in winter? How often did you use the heater? How flat / mountainous is you daily drive? The car arrived on the dealer lot in february 2017 where it was used as a demo car until I bought it in october 2017 with 7000km on the odo. For the daily commute, I rarely drive above 80km/h. Braking goes with the trafic but I try to maximise the use of the B mode so I mostly use the brake only for the last few km/h. I saw over 40C a few time this summer which is really unusual. The AC was used a lot this summer. Normal temperature is about 25C in the summer. The lowest I saw was -33C. Normal temperature in the winter is anywhere between -5C to -25C. I use the heater for 6 months in a year. guiacan thanks for the extra info. am hoping we see a pattern that helps explain why some cars are degrading so much faster than others. Last edited by JejuSoul on Sun Sep 02, 2018 8:25 am, edited 1 time in total. My Soul is down to 79.1% SOH. I have the OBD installed running Torque Pro. I am willing to start collecting weekly data for entry into your spreadsheet if you would like to have my data. Reading this thread, it looks like most have not experienced degradation. Let me know exactly what data I need to collect weekly from Torque Pro to provide, and if I can enter the data myself. I have 32,000 miles and live in a warm area (Pasadena) of Southern California. RubberToe wrote: ...My Soul is down to 79.1% SOH. ..
Hi RubberToe thanks for posting your data. You will be able to get a free battery replacement once your degradation reaches 70% SOH. I don't know why your car is degrading much faster than any of the cars reporting here. It is temps above 45C that destroy the battery fast. = Phoenix Arizona. I think it will be 2 or 3 months before you get low enough to get the battery replacement, so am grateful you offered to take some OBDII data. None of the regulars here have much degradation from usable capacity so we have nothing to explain what is going on. Note SOH = 100% means that the 10% buffer at the top has been lost over the years. Originally it was only the Phoenix cars that were dying but now there are a lot of cars reporting battery problems at about 100,000km. Possible reasons - driving fast, Charging to 100% SOC, Fast charging all the time ??? We don't know. The first data I would like to check from your car is the 96 cell voltages. 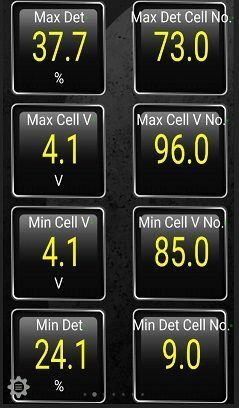 Could you have a look when the car is fully charged and see if one cell is way different from the rest. If so that cell has probably failed, and that is what is causing the problem. Here is what I have so far. I didn't have the extended PIDs loaded for individual cell voltages, but I have that installed now and will head down to the car and see what they are. Can you tell from the below screen if there is something I should zero in on? Cell #73? A couple weeks ago we had a week of daily high temperatures of 37 C, it hit 43 one day I believe. Last edited by RubberToe on Sun Sep 02, 2018 9:54 am, edited 1 time in total. All 96 cell voltages are reading either 4.1 or 4.08. I'm at 99.5% charge I believe. JejuSoul wrote: Possible reasons - driving fast, Charging to 100% SOC, Fast charging all the time ??? We don't know. I don't typically drive over 65mph, not sure about the wife who has been driving mostly the last year. She gets home from work and charges to 100% every night, parked in garage underground, her commute is about 25 miles each way. Very unlikely the problem is DCFC, at least in my case. I probably only DCFC a total of <15 times in 4 years. Only did a single trip that required DCFC, that was 120 miles one way.